Planning Thanksgiving in Cornwall | Notes from the U.K.
We’ve started planning our Thanksgiving party. The guest list is limited by the size of our house, which is a shame because we’d love to add more people. And since there’s no competition—no one says, sorry, but I have to go to my brother’s this year—almost everyone we invite is available. And it’s an American holiday, which gives it an element of cool here. Our tradition, both here and back in Minnesota, is that we cook the turkey, cranberries, sweet potatoes, and pumpkin pie (usually; back in Minnesota, as D. got older he became a very good cook and he brought the pies), and we ask everyone to bring something. Which is where it gets interesting. The first time we invited we invited M. and J. to our Thanksgiving in Minnesota, was the first time I understood how rigid the traditions are. J. isn’t from the U.S. but she was the cook in the family, and as they told the tale later, M. said “No, you can’t bring that” to everything J. suggested. Macaroni and cheese? No, you can’t bring that. Chocolate cake? No, etc. So this year, a different J.—an American—told me she’d have to explain to P. that just because root beer floats are American doesn’t mean you can have them at Thanksgiving. I looked at the list of what people were bringing: leek gratin, cauliflower cheese, quiche. Don’t bother, I said. We’ve given up the battle. The only traditional elements of the meal are the ones we make—turkey, cranberries, sweet potatoes, and pumpkin pie. And baking powder biscuits, which weren’t traditional in my family, but Wild Thing’s from Texas and will never say no to biscuits. The rest is all stuff that would get us all deported if we tried it in the U.S. So we’ve evolved our own traditions, one of which is the meal isn’t traditional. A second involves me, the vegetarian, cooking a dead bird. Which hardly even strikes me as strange anymore. A third—one we’re trying to break—is that I make cranberry sauce and forget to set it out. 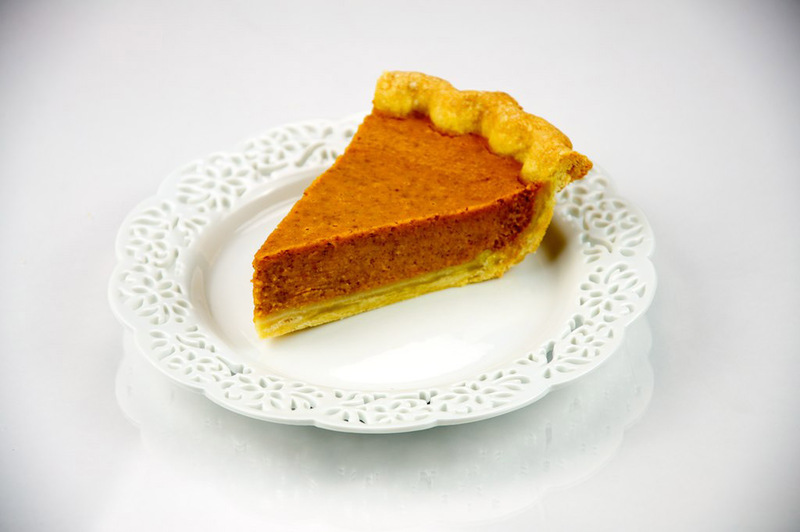 A fourth is that we have to have at least one dessert that isn’t pumpkin pie, because although pumpkins grow here they’re considered a squash and people are, um, let’s say hesitant about eating it as a sweet. But we do have to have it. That’s tradition for you. Besides, a few of us like it. This entry was posted in Food, Holidays and tagged Americans in Britain, Americans in England, anglophile, Britain, Cornwall, cultural dislocation, England, food, holidays, Thanksgiving by Ellen Hawley. Bookmark the permalink. Sadly, it’s not one I made. I’m still working on making a pie that looks like it was made by an adult. Who’d been in the kitchen before. Thanks for that. You made me laugh. It’s not all bad to have different things for Thanksgiving though. As long as people enjoy and eat them, I’d rather that than something traditional that no one eats. You find the most interesting things to write about! It’s a great topic. Thanks for saying that. Sometimes I wonder if I’m wandering off into the land of No One’s Interested in This But Me. I have the same problem and it’s discouraging some days. Supposedly I have almost 400 subscribers, but only a few of them have taken time to become friends. I never ever hear from the other 380+. I have no idea why they subscribe. Wild guess? Most people view blogs as reading material, not places to interact. Until I started blogging myself, I saw them the same way. The strange thing about the topics I don’t expect people to be interested in is that they’re often the ones that get the most response. Which, I guess, goes to remind me of how little I really know about what goes on in other people’s heads. I am now wondering what IS traditional apart from the above mentioned!!! It’ll vary a bit from region to region and family to family. We used to have turkey, stuffing, gravy, a green salad, some sort of cooked vegetable, baking powder biscuits, mashed potatoes, sweet potatoes, and pumpkin pie with whipped cream. And coffee or tea. By the time we got through that, no one could move. Well, being from a particular part of the south with our own food traditions, we almost always have field peas (which only seem to be a thing in the Carolinas and are NOT the same as black eyed peas but ARE related) and sometimes collards and ALWAYS pecan pie, in addition to the aforementioned items. Stuffing but outside the bird so it’s called dressing, and mashed potatoes because gravy. Biscuits if someone wants to but usually we don’t because they take up space that could be used for dessert. Oh and wine. Then we go for a walk or just lie on the floor in a food coma. Happy Thanksgiving!!! When I got to “go for a walk” I was impressed that you were still capable of that. Then I came to the food coma. Welcome to the real world. You really ought to do a jello salad, too. Only, be sure to have vanilla ice cream handy, because to non-Americans, jello salad and vanilla ice cream are a YUMMY dessert! As The Final Rinse just commented, everybody’s tradition is different. The closest we’ve come to jello salad, to date, was the year another american brought a waldorf salad. In her family, you couldn’t hold Thanksgiving without it. Hope your Thanksgiving feast was as good as ours. And in case you’re looking for something delicious to bake up during cold weather, see my latest post! YUM! Send a link so people can find it. We usually do Thanksgiving, with the odd year at someone else’s table. Believe me, not everyone’s Thanksgiving is the same tradition. Last year, it was tofurky at a friend’s house. At our place, we do pecan pie instead of pumpkin. I think that it is normal to bake the turkey with a few pounds of grapes, but we have had guests look at it stranglely. I never could convince myself that tofurky was a good idea. I just eat everything that isn’t meat and it always adds up to a meal–and then some. You’re right, though, that the traditions vary. But it’s odd, isn’t it, that somehow we all end up calling them traditions, as though they’d been carved in stone? Hi Ellen! Thoroughly enjoyable post. When we moved South via Massachusetts (and, yes, I lived in Minnesota too…. ), I was shocked to find macaroni and cheese on the table. What? Don’t these people know the rules? Sweet potato pie and cornbread dressing (never stuffing) did their part in converting me to a more southern table these days. Sweet potato pie could convert me to just about anything. Do you know, since I moved to the U.K., I have not been able to make decent cornbread? I’ve tried several recipes, and I brought one of those round American cornmeal containers back from an early trip home, but somehow it never works. Is it the humidity? Our neighbors’ accents? Hmmmm, that is a puzzle. All other things being equal, it then makes perfect sense to me that the blame lies with the accents. Thanks for saying that. I’ll sleep better knowing that it makes sense to at least two of us. All of the above. On cornbread, I use the same recipes that worked in the U.S. Any number of ingredients are somewhat different here (as are cups, ounces, teaspoons, and tablespoons, by the way), and some can be adjusted to while others can’t be. Chocolate chips, for example, aren’t the same and I have a secret stash of American ones. Other things, if you know what the problem is you can adjust for it. If you don’t, you just stand around and wonder what hit you. I now make pies for actual pumpkins–bake, cook scrape, freeze, thaw, drain, smoosh, then begin as you would with the canned stuff. But thanks for the thought. Hi again Ellen–Flo pointed out you couldn’t use bacon fat, being vegetarian, though I did have a vegetarian partner who said bacon didn’t violate the deal, and a Jewish pal who sort-of kept Kosher but felt that bacon could be allowed. I love Brussels Sprouts which we grow and use (about the only crop still viable here in December) but I wouldn’t add it to cornbread. You’ve probably figured out the conversion between a 450 F oven and whatever the British gasmark should be–can you sing “Land of Hope And Glory” or “God Save The Meal” while baking? Your blog is very enjoyable! 1. I can’t sing either. They neutralize the effectiveness of baking powder. I can’t explain it, but I think the baking powder’s very wise. 2. Gas marks only work on gas ovens. We have an electric one, which is handy when the power goes out, as it does periodically. 3. Around Christmastime, the British will add brussels sprouts to everything. Cornbread, martinis, cranberry sauce and mince pies–you name it. Now I am really missing Thanksgiving with the two of you. And I really remember very little about what we ate! Although I think you made a chocolate pie of some sort one year that was delicious—and I’m sure I roasted Brussels sprouts a time or two . . .
We’ll miss you as well. Ah, Ellen, the circumstances win overwhelmingly! You are doing a heroic job with your cooking and with your blog, so i won’t dare offer any other advice. We can both be glad neither you nor the Wild Thing require Minnesota traditional Christmas fare like rommegrot, lutefisk, or other strange old Scandinavian messes (sorry, I can’t get diacritical marks on my computer). Though people churning butter by hand used to sing to it in Norwegian or Scots Gaelic to get it to form—try other languages? On to the Brussels Sprouts egg nogs or hot toddies! Oddly enough, we never needed them in Minnesota either. Especially the lutefisk.